The combination of working from home and managing the lives of a family of four means accumulating a lot of paperwork. Despite my efforts to live a paperless lifestyle—via scanning and recycling—I simply cannot live without a good filing system. For many years, I used a beat-up old filing cabinet stashed in our garage to store all our volumes of documents. It was in the garage because it was a deeply unattractive, tall and beige metal monstrosity. Going back and forth to the garage was not ideal, however, and when two of the drawers finally gave into the South Carolina humidity and rusted through, I decided to upgrade to an elegant, solid wood filing cabinet that I could proudly display in my home office. But what to do with the old one? Throw it away, my husband urged. I have to admit I was tempted, but after doing some research I found a myriad of good uses for an old filing cabinet. Chief among them was turning it into a garden storage system for our tools. We have a large half-acre backyard, so we’ve accumulated quite the collection of garden tools, which were scattered in various corners of the yard. 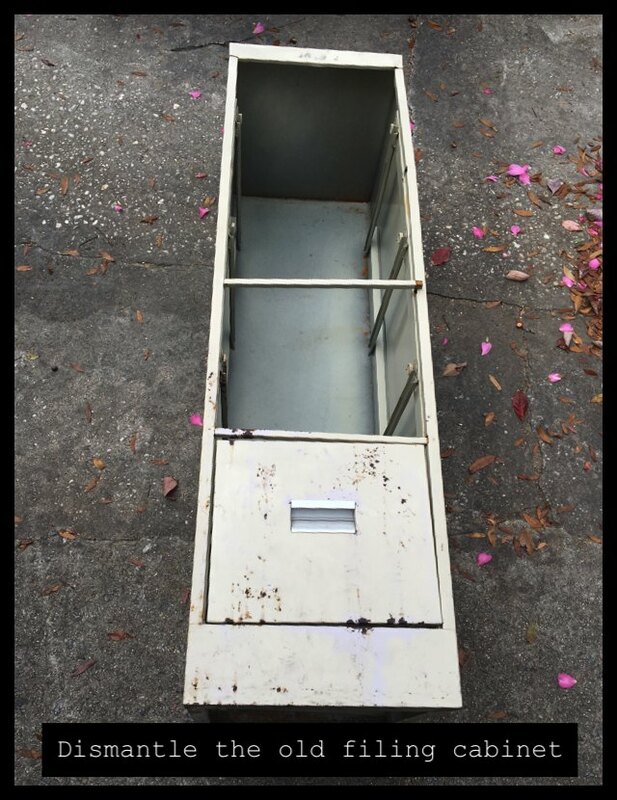 I set about upcycling my old, rusty filing cabinet into a shiny new garden storage system. It was a surprisingly simple project and cost just under $30. The first step was to dismantle the old filing cabinet and get rid of the rusty old drawers and other unnecessary innards. Leave the draw sliders, though, as you’ll need them later. Next, we built five wooden dividers to separate the compartments and allow for storage of different items in each section. We took a large piece of plywood and, using a circular power saw with a rip-cut to keep the edges straight, cut five pieces of wood to equal size to fit into the filing cabinet’s main compartment. These then slid neatly into the four drawer sliders. We nailed the fifth one to the bottom to close the hole left by the absence of a drawer. Finally, we painted the whole cabinet with Rustoleum latex outdoor paint. We chose a forest green color to compliment other features in our backyard. We applied two coats with a roller and used a paintbrush to touch up the smaller areas. Then all that was left to do was fill it up with garden tools and put it in place! As an environmentally conscious mom of two, Jennifer Tuohy tries to think of cool, unique ways to reuse her old furniture. Once you upcycle your old piece and are looking to replace it, visit The Home Depot to see a large selection of home furnishings.